Living Real Empowerment Initiative — Living R.E.A.L., Inc.
For our projects abroad, Living REAL aims to administer and manage life improvement initiatives, medical missions and educational resources to the citizens of Uyo foremost, with plans to spread the effort to the other municipalities of Akwa Ibom State. These efforts fall under the Living REAL Empowement Initiative which works to preserve the cultural heritage and social identity of the state, increase economic and education growth, and encourage the spiritual well-being of the persons in need. Currently, the only project that fall under the scope of this initiative is Project Rebuild,. Focusing on Ikot Ekpeyak Community Secondary Commercial School (located in the Ikono Uyo municipality of Akwa Ibom State Nigeria), Living REAL began it's work towards helping the school in 2016. Initially an illegal private school, the surrounding community of parents and neighbors worked to gain governmental approval which led to the school's official founding in 1980. Living REAL's team abroad became very familiar with the campus and the staff, providing us with a first hand knowledge of the school's existing issues and concerns. Working closely with the teachers and the school principal has also provided us with a deeper understanding of both educational and life needs of the students. Living REAL aims to serve the school by first concentrating on the improvement of the infrastructure, followed by providing teaching aids and resources for the students. We hope you will join us in working to change the lives of these students, improve a community, and help in the establishment of a legacy of quality education at Ikot Ekpeyak. Rebuilding Ikot Ekpeyak Secondary School, reducing distractions and/or hindrances to learning and development of goals. Instill hope for current and future students by helping with the day-to-days of school (i.e. books, uniforms, etc). Creating vision via focusing on long term goals of rebuilding local community by strengthening the career and life goals of the children within it. Both of our fundraising pushes, the REAL Life and REAL Love Campaigns, function to raise monies integral to the start and progression of this project. Your help and force behind these campaigns are deeply felt with each donation given and we continue to look forward to showing you the difference your support makes! Winter 2017 (December) saw the groundbreaking for the building foundation at the location chosen for the new Ikot Ekpayak School. We are also proud to announce that our organization was officially approved as a NGO (non-governmental organization) by the Federal Republic of Nigeria! This recent recognition indicates to us that the global reach of our impact has been solidified and it makes us even more motivated to make the difference we seek to make! Members of Team Living Real Abroad have carefully selected an architect for the design and construction of the new school and have been working closely with the candidate to ensure that the design accurately meets the needs demonstrated by the students, staff, and the community it will serve. As further details are provided on the progress of the construction (pictures and other updates), we will post accordingly to maintain project transparency for our donors and sponsors. Fine Arts/Home Economics/Technology Classroom Block, also in need of repair. Another building noted by principal as urgently in need of the most repair. The converging point of the school campus and one of the areas in most need of repair. Host various classes. Space needed for large student population. Ikot Ekpeyak currently hosts approximately 1,091 students on a consistent basis. Previous years saw an even higher population of students according to school administration, but the increasing dilapidation of the campus infrastructure combined with the long distances many students must travel to make it to school has led to a steady decline of student attendance. Ikot Ekpeyak's principal, Mrs. Mary Pius Owo, conveyed to our Living REAL team abroad on the ground in Nigeria deep gratitude for the interest shown in helping the school and believes that the help we can provide will directly impact the learning ability of the student base. 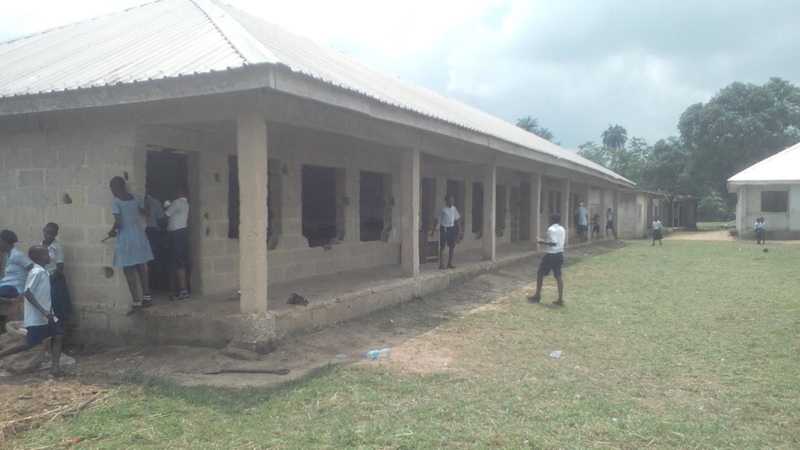 According to Mrs. Owo, the damaged and worn condition of the buildings does not truly allow effective teaching or learning of the subjects at hand and she urgently seeks help to rescue the school from potential total collapse without outside aid.